When summer rolls around, many drivers start to take vacations and lengthy drives to a myriad of locations. With the summer tends to come a substantial amount of rain, which is why it’s so important that the tread of your tires is in good condition. Even when it’s not raining, the only way to be certain that your tires will get proper traction on the road is for the tread to be in as healthy a condition as possible. When you are getting ready for the summer, you should consider checking the depth of the tread to identify whether or not you require new tires. The best way to ascertain whether or not the tread of your tires is in good condition is to check the tread depth. There are a variety of methods that you can do to check this, but likely the easiest method is what’s known as the penny test. The tire tread within the United States is measured by dividing an inch into 32 parts. When you purchase a new tire, the tread will typically measure at either 10/32 of an inch or 11/32 of an inch. 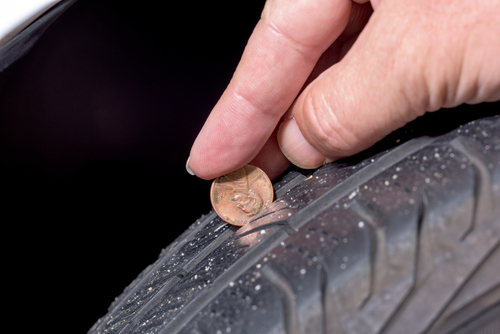 You should always replace your tires if the tread depth gets down to around 2/32 of an inch or less, which can be readily identified by using a penny. Take a penny and place it inside one of the many tread ribs situated on one of your tires. Make sure to turn the penny to the point that the head of Lincoln is pointing downwards. If you can’t see any of the top of the head, this means that the tire tread is at a good length and that your tires do not need to be replaced. If you do see some of the top of the head, this is a sign that the tires should be replaced. Perform this test in several places on each tire. If the tread is uneven in some places, have them checked out by a mechanic to make sure that they’re aligned correctly. The primary reason that the tread of a tire is so important is because it determines how well your tire grips the road. As the tread becomes worn down, the ability for your vehicle to stay on the road during inclement weather is heavily reduced, heightening the chances that you hydroplane when the road is wet or skid off the road when it’s filled with ice or snow. With a proper tire tread, the chances of a tire popping is also reduced, which is beneficial during lengthy car trips during the summer. If you have recently been injured in a car accident or for any other reason and believe that another party was negligent, get in touch with one of our Brookfield auto accident lawyers at Cannon & Dunphy today so that we can provide you with the representation you deserve. Contact our team today to speak with our Milwaukee auto accident lawyers.